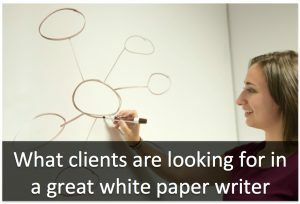 I had an opportunity recently to interview some clients about their experience with white paper writers. (As well as those who write special reports, ebooks, and other types of “long form” content.) The results were interesting — to say the least. Much of what these clients said didn’t surprise me. For example, they were unanimous that “meeting deadlines” was a desirable trait. However, there were a few characteristics they emphasized that I didn’t expect to hear. 1. A fan of white papers. That makes sense. After all, there’s a reason Stephen King writes suspense. He’s a fan of the genre. White papers, too, is a genre. So if you’re going to craft these documents, read them. Study them. Become an aficionado. Almost unanimously, clients told me they want a writer who can strategize the development of a white paper. That means collaborating with the client to develop the topic and approach, dream up a great title, and basically be the brains behind the piece. Another trait clients want to see is curiosity about the white paper topic. “I want to get a sense that the writer is as enthusiastic and curious about our innovative approach to training as we are,” said one client, CEO of a sales training firm. That’s why, as a marketer and copywriter, I focus on industries that fascinate me. This has become an important skillset of white paper writers in recent years. Content is becoming more visual — simply because there are more visual learners — and, although clients recognize you’re not a designer, they do want you to contribute ideas for photos, charts, graphs, infographics, etc. For example, I just finished writing a special report for a client where I recommended including two graphs and an infographic. He thanked me for the suggestions. So there you have it. Four surprising (at least to me) traits of a great white paper writer. If you craft this type of content, be sure to demonstrate that you’re a fan, a strategist, curious, and able to recommend visuals. Because if you read this far, you probably are. As always, great article, Steve: informative and succinct. Thank you. I fell into writing white papers. [Client asked me if I could: I replied, “Yes, of course!] I love writing white papers. This will help me hone my skills, especially #4. Very helpful to know what clients prefer. Thanks Kristi. I’m glad you found the article helpful! This is my first visit to your site and I discovered you though “make a living writing dot com” and I must confess that I love what you’re doing on your blog, especially your header. Coming to your post, I agree with everything you said especially the point about being a visual person and also being a strategist. No client want a dull writer, they all want a vibrant writer that they can brainstorm and rob mind with. Thanks for sharing Steve and I’ll surely be back. Thanks for this, Steve. I’m not surprised by these 4 things as they mirror my experience. As your Stephen King examples illustrates, good writers are either fans of their genre or they study it to understand effective practice. All marketing should be strategic,and part of the value that we bring is our ability to help our clients execute marketing programs that are strategically aligned with company objectives. The curiosity characteristic is interesting.One of the reasons my clients work with me is that I specialize in their business. I have been on their side of the desk as a marketing and sales executive in the education industry, so my knowledge about the marketplace is valued by them. It’s my chosen field and I continue to be both a practitioner and a learner in it. And finally, over the last year, more clients have been asking for my visual suggestions, graphs, lists of data points for infographics or photographs.So this is a trend that I’m experiencing as well. As always, thanks for your great insights. Hi Annie. You’re obviously seeing the same trends I am. So it’s important, as white paper writers, that we communicate those traits when speaking with prospective clients. Thanks so much for this helpful post. I’ve not yet written a white paper but it’s a niche I’d love to break into, so I’m reading up as much as possible before taking the plunge. I’ve bookmarked this for future reference. Elizabeth, please sign-up for the free teleclass next week on breaking into white paper writing. Yes, there will be a “pitch” at the end for a paid workshop, but if you’re not interested just hang up! The teleclass itself will contain plenty practical ideas to get you started. Thank you Steve.Am grateful to you for registering me for bi-weekly newsletter. The stuff you sent to me has greatly shown me some way on copywriting that I have not seen before.I would have ordered for some of your books and register for your courses but am rather new in this country and I need to settle down a bit, get some job and raise some money to enroll for your courses.I have been presenting papers at conferences in my country before relocating to the USA a little over a year ago. I will be to be privileged to learn copywriting under your guidance. As always, your information is interesting and valuable. 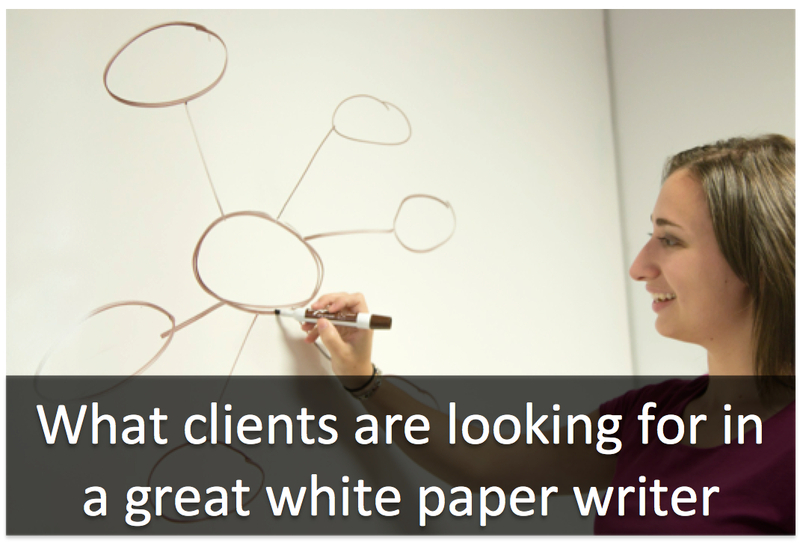 I want to focus on white papers in the B2B health industry (maybe some technology). While a couple of them surprised me, they all make perfect sense. Getting this kind of information directly from clients (through you, of course) is very motivating.